【4K Ultra HD Videos & 16MP Photos】 With the 4K high resolution, you can use the action cam to record stunning footage and great details. 1080p FHD video recording and image freeze-frame at 60 frames per second bring you clear and vivid quality. Built in Time lapse, slow motion, loop recording, can be used as a security cam, dash cam. 【2-inch HD LCD Display with Highest Video Resolution 4K@30fps】 Built-in 2-inch HD LCD display on the back, portable and easily to shoot or view real time video or picture. 【Advanced CPU and Sony IMX 179】 The action camera can record videos at Ultra HD 4K and perfectly captures motion at high speed, thanks to Allwinner V3 and the advanced CPU Cortex-A7. Sony’s IMX 179 sensor is more advanced than other 8M sensors on low light operation, frame speed and power consumption. 【Wireless Control】 Built-in WiFi, you can connect it to the APP in your phone, use your mobile phone to preview the photos and control the action camera. This WiFi is not only a remote control, it allows you monitor in real-time, review videos, photos on your smartphone or tablet. WIFI wireless range up is about 15 meters. 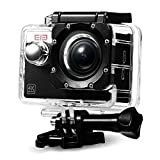 【A Variety of Accessories and 12 months Warranty Guarantee】 Come along with tons of accessories, you can transform the 4K action cam to fit various indoor and outdoor extreme activities. With integrated WiFi (15m), built-in rechargeable 900mAh Li-Ion battery, working time about 2 hours at 1080P. This camera has Adopted Sony IMX179 image sensor, it has a great performance in low light. The frame rate can be up to 30fps. The IMX179 sensor is much higher quality in comparison to other 8M sensors, especially in these key areas, low light performance, frame speed and power consumption. New photography modes for night and time-lapse at night provide customizable exposure settings for single and time-lapse photo, with maximum exposure for 30 seconds. This entry was posted in Discount Photography and tagged 16MP, 170°, 2.0”, 4K@30fps, Accessories, Action, Angle, Black, Camera, Case, Elephone, lens, Mounting, Screen, Sport, UltraHD, Waterproof, Wide, WiFi by Ball Photo. Bookmark the permalink.